As I mentioned in the previous post, the Arctic Cooling Freezer 13 Pro cooler didn't fit into Dell XPS case. What to do? I didn't like the option of exchanging it for a smaller one, as smaller fan would be louder, as its smaller fan needs to rotate on the higher RPM, which eliminates the main goal of making my PC quiet. So I decided to replace the case. I didn't like the XPS 9100 case anyway - it was not designed with silence in mind. Nothing was done to make it quieter - no insulation, the hard drives, DVD drive, and fans are screwed directly to the case, without any vibration dampers. The only good thing - it had 120 mm case fan, which wasn't too loud, rotating at not very high RPM. 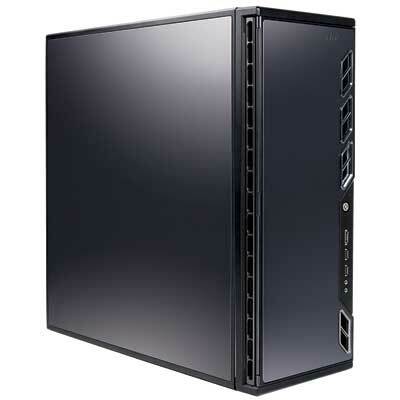 The main silencing features of this case are: three-layer, sound-deadening side panels and front door; HDD mounting with special cages and silicon anti-vibration grommets; a separate chamber for the power supply in the bottom of the case also helps to reduce noise. This case was in stock at A-Power, so I bought it from there. I spent the whole evening moving all Dell components from the XPS to this new case. It is slightly bigger than XPS 9100, and with the top fan removed, the Arctic Cooling Freezer 13 Pro fits perfectly. Of course it didn't go as smooth as I planned. When I installed all the parts, connected everything, and powered it up, the computer didn't want to boot. It kept complaining about the front USB not connected. It also wanted a case fan, so I connected one, and the error message disappeared. But that front USB was painful! First I tried to connect the case front panel - the error was still there on the next boot. Then I got a card reader with ports USB from the old computer, connected that panel, switched on - the same error message. Finally I just disassembled the XPS front panel, removed the card reader with USB ports from there, connected the cables to the motherboard, and that helped! The computer had finally booted. Apparently those original USB ports from the XPS are special. It looks like they have some capacitors, which are probably used to detect the connection, so the motherboard only works with the original USB ports panel! I didn't really need those ports and the card reader, but didn't have a choice - they had to be connected for the computer to boot, so I put the USB panel inside the case (just used some wires to keep it in place), and connected a couple of USB extenders, so I could at least use those ports. I also found a place for the card reader: could put it into 5" mounts in the front of the case. It doesn't look very aesthetically pleasing, as it's supposed to be covered by the cool shiny semi-transparent panel of the XPS case, and that panel is not detachable. But at least it is connected properly, so the computer boots, and the reader is even accessible, so I could use it to read from the SD cards used in our cameras. It is not dead silent yet, as there are still 5 working fans inside, but the noise they produce is very low. During the day with all the normal sounds around I can barely hear it. And even in the night it's not very noticeable. My Dell XPS is still loud. Next component to replace is the CPU cooler. It seems to make the most noticeable sound now, especially on load - when building the CPU is used up to 100%, gets hot, and its fan starts buzzing like it's going to take-off. It is supposed to be very quiet and work much better than the original cooler. So, I got it, opened the case of my Dell, and found the next surprise: the CPU socket on this motherboard is very close to the edge, so close that the huge radiator of the Freezer 13 Pro does not fit into the place without removing the power supply. What a disappointment! Now I have to decide what to do - take a smaller cooler so it fits there, or bite a bullet, and move the whole computer into another, even bigger case. This Dell XPS is pretty loud. I knew it wouldn't be the best, but I didn't expect it to be that bad. It might be OK in a regular office environment, but in my home office, where there is no much noise around, the computer is the loudest piece of equipment. The most annoying thing is the video card. By the way, its brand is "Pegatron" - I've never heard of this name before. Apparently that's a part of ASUS company, which split several years ago. This video card has a very cheap small and extremely noisy fan. I was tired of that noise, and after I got a permission from Mozilla IT guy to modify my PC (as long as I don't break it :)), I started from that annoying little VGA cooler. 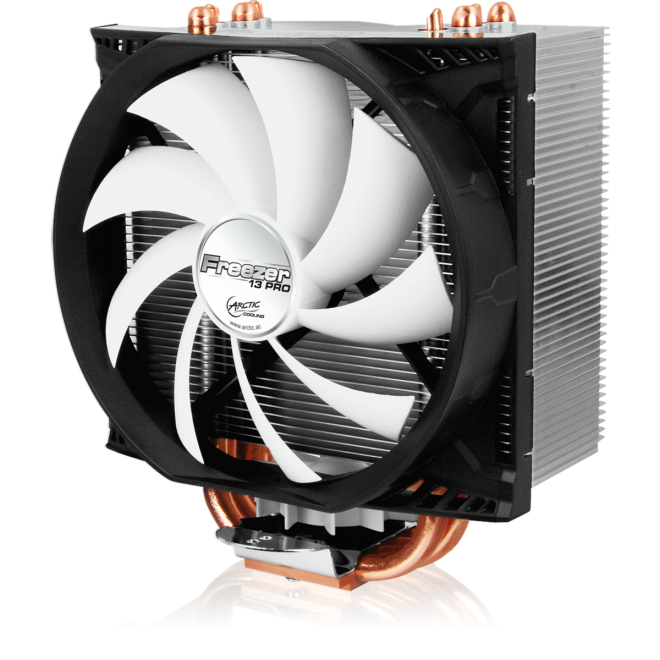 I had a pretty big and heavy copper VGA cooler, which I bought several years ago for my HTPC. Since then I upgraded the motherboard in the HTPC, to the one with integrated nVidia 8200, so this VGA cooler was not used. Luckily its mounting screws could be adjusted to fit the holes on the this ATI HD5670, and the radiator did not touch any parts, so I installed it. There was one problem though - the original fan on the VGA cooler was connected to the card itself, and that connector was too small for a 3rd-party cooler fan. Dell motherboard doesn't have any more fan connectors, so I had to be inventive - I cut two pieces from a paper clip, ground them down a bit, inserted into a floppy drive power cable, and connected the fan to that improvised power source. It worked! I put everything together, and now my computer is noticeably quieter without that constant buzz from the video card. I still had a lot of useful files on my old PC, and it wasn't convenient to access them. It's especially confusing when there are copies of the same files and folders on two machines (like "My Documents" folder, where I had a lot of stuff - from everyday notes, to my financial data needed for tax return). As I've switched to a new PC, I decided to move the hard drive with all my stuff into it. I also had an SSD in the old PC, which I wanted to use. So, I repartitioned an older 500GB disk, which I had available, moved the system and all the required data to it, got SSD and the HDD from the old PC, opened Dell XPS, ready to install those two drives, and suddenly stopped confused, as there were no place to connect these drives - there was only one SATA connector available! Also there were no place where I could put the SSD so I could screw it to the case - the case was designed only for 3.5" drives. Well, it's not the first time when I had to invent something, so I managed to connect the SSD and fix it in place, but another HDD was out of luck. Does this Dell motherboard really have only one extra SATA port?!? Copyright © 2012 Alex Pakhotin. Simple theme. Powered by Blogger.